On 1 January 1994 the North American Free Trade Agreement (NAFTA) came into effect in Mexico, the United States, and Canada and converted the region into one integrated market by removing all trade and commercial barriers. This move showed the Mexican government’s sight and interests lie to the north of the American continent and its ever-increasing perspective that economic growth is through liberalising trade with nearby rich business partners. Simultaneously in the Mexican state of Chiapas, bordering to the south with Guatemala, a group of indigenous people banded together as the Zapatista Army of National Liberation (EZLN as its known by its Spanish acronym) led an armed uprising. Going back some years, the EZLN had become convinced that the country’s transformation could not come about through institutional bodies: peaceful means had been exhausted. In the ensuing years after the first EZLN camp was established in Chiapas in 1983, they had been making efforts to build up support by weaving solidarity networks amongst local organisations. On the 1st of January 1994, the Zapatistas publicly declared war on the Mexican government and forcibly took over the municipalities of San Cristóbal de las Casas, Altamirano, Chanal, Ocosingo, Las Margaritas, Oxchuc, y Huixtan. For the majority of the population in Chiapas, life was marked by high levels of poverty, marginalisation and inequality. The Chiapan political system was oligarchic, based on patronage and repression. All this and the growing neoliberal drift of Mexico’s government policies, as was happening in all of Latin America, caused further deterioration of the population’s living conditions, massive unemployment and a reduction of State social spending. It wasn’t the first time the indigenous communities of Chiapas rose up in rebellion. The Mayan people were outstanding amongst the indigenous communities to resist the longest against the Spanish conquest. In the Yucatan and Guatemala, they were not subdued until 1703 and these same communities, again in 1994, rose up in rebellion. About what? About a renewed – institutional – violence that for years had been trying to destroy their identity and traditions. The roots of the rebellion can also be found in how Chiapas developed in the 20th century: changes to traditional agricultural methods, dispossession of indigenous territories and ways of working. Simply put, less land for more poor people. All of this, in addition to the absence of institutional channels for complaint contributed to some indigenous communities coming together as the EZLN and later rising up in revolt. Although the EZLN has been an influential actor in the Zapatista movement, it hasn’t been the only one. In fact its own existence and continuation have been the result of relationships between a number of important actors such as indigenous communities and international and national civil society. The EZLN is part of a military movement, led by the Clandestine Revolutionary Indigenous Committee (CCRI) – the General Command. The military bases were made up of indigenous people, individuals from the Catholic Church, autonomous organisations of small producers and agricultural workers, and the political left. This sociocultural heterogeneity was an essential element in the creation of new ideological and organisational dimensions. It’s also important to highlight the role of the Dioceses of San Cristobal and how it supported an ideological shift in promoting new organisational practices and encouraged reflection within the different communities. On the other hand there are the civilian bases which support the EZLN but are not part of the military structure. These are the indigenous communities of Tzeltales, Tzotziles, Tojolabales, Choles and Zoques mainly located in the Highlands and the Lacandon Jungle in Chiapas. The last main actor in the movement is international and national civil society, from which great support comes from organisations on the political left, non-governmental human rights organisations, university communities, intellectuals, international bodies like the UN, OAS, the EU and development cooperation agencies. What opportunities did the Zapatista movement have to influence the political landscape? First it could be said that globalisation was opening up favourable possibilities for new actors and opportunities to influence the national and international playing field. The support from influential civil society allies who dedicate themselves to indigenous themes made this even more so. On the other hand, seeking international recognition and the progressive establishment of ideas about democracy and human rights assumed diminishing State repression. However the local political opportunities were totally to the contrary: the ascent to power of a governor with a military background brought in a new phase of repression and hardening State laws. Last the appearance of supranational bodies charged with supervising the agreements gave way to a new technocrat class in the government which provoked changes in power relations. While forging new political alliances with the government, instability amongst the local political bosses (“caciques”) who used to benefit from the ways things were before. 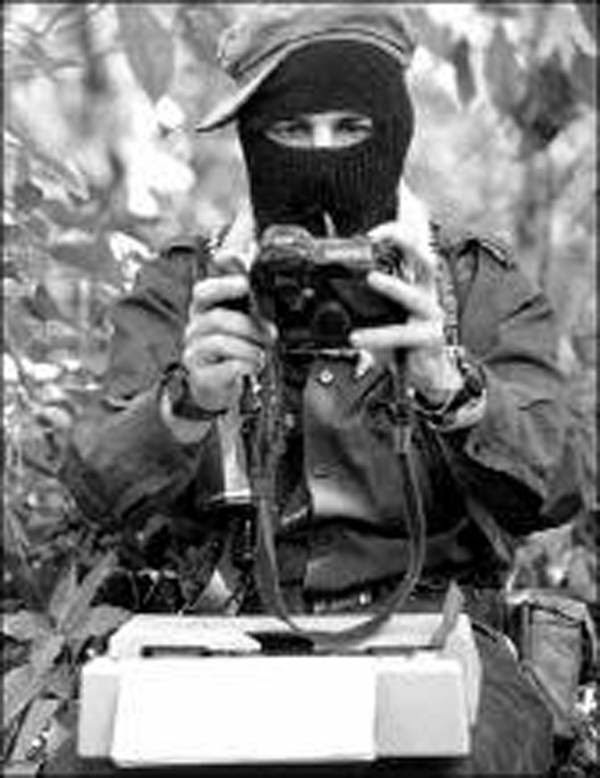 The only time the EZLN has taken up arms was from 1 to 12 January 1994, when a ceasefire agreement was signed. Since then the Zapatista strategy can be summed up through various core themes running simultaneously. In first place there is the construction of autonomy in resources, the means and processes to ensure the indigenous communities’ survival. In practice this means the appropriation of land which now makes up the Autonomous Rebellious Zapatista Municipalities. In turn these places are administered as spaces for gatherings and dialogue, first as “Aguascalientes”, then as civil self-governing entities like the Councils of Good Government, or the “caracoles”. New technologies like the Internet has been another important medium, permitting the Zapatistas to disseminate their message and create a worldwide network of solidarity that has succeeding in putting the movement in the foreground of global politics. Another Zapatista strategy has focused on searching for an opening to dialogue with the government and Mexican political class. The first step to being heard is to be recognised as a conversational partner and from there take action towards satisfying demands. Effort has also been made to draw in and seek support of national and international civil society working against corruption in the Mexican government as well as against global implementation of neoliberalism. In terms of collective actions, the Zapatista movement has carried out numerous marches, consultations and gatherings with civilian and EZLN base communities. There are also countless written works, like manifestos, complaints, declarations, reflective essays and short-stories, and political proclamations. Artistic works include videos, photographic expositions, paintings, murals, clothing and music concerts. Without doubt however, the Declarations from the Lacandon Jungle are the best reading resources about Zapatista history. The first was the declaration of war, read from the balcony of the municipal palace in San Cristóbal when some 2,000 armed and hooded indigenous people seized control of the town on 1 January 1994. The second one called for civil society engagement; the third, the creation of a movement for national liberation and the fourth proclaimed the civilian Zapatista Front of National Liberation. The fifth declaration initiated a National Consultation, a grand round table talks with everyone but the government; and the sixth and latest kickstarted “The Other Campaign”, a Zapatista campaign running parallel to the elections in Mexico in 2006. The messages and turns of phrase found in the EZLN’s writings, letters, interviews and declarations show how its innovative ideological output has brought them to occupy a high profile space without precedent in the history of guerrilla movements. Their main motivation is innovative use of political symbols. Their cultural system – which includes cultural and ethnic elements like their languages, beliefs, rituals, customs and traditions, as well as their economic capital and system, material production and social structure – combine to form a framework which interprets reality in ways different from the dominant culture. It’s a traditionalist system, derived from the historic memory linked to indigenous rebellions and pre-Columbian Mayan writings. Their cosmo-vision is characterised by a spirituality distant from the individualism of the West, strongly connected to nature and communal life. According to the Zapatista narrative, there was a time in the past when they lived in communal, egalitarian ways, in human solidarity and in harmony with nature. The arrival of the conquistadors threw them into a situation of poverty and put them in risk of extinction. Arbitrary government actions and being considered third class citizens meant they had to be quietly eliminated for the sake of the country’s modernisation. During the 1970 and 80s space opened up for a “cognitive liberation”, and during this time ethnicity was examined, articulated and politicised through the lens of both ethnic and political identity, connecting and elevating the importance of this reality. This is when some began to self-define as the “first people”; the “small” people, those “without faces”; “those who come from the night and the mountains”; the “poorest of the all the poor within all this poverty”; those who are “the colour of the Earth”; those “dignified and rebellious”; “the Mayan people, sons and daughters of the days, existent across time”; “those never listened to”. They projected an image of steely dignity while at the same time impoverished victims. When the collective identity is perceived to be at risk, a clash between what “is” and what “should be” is triggered, provoking feelings of outrage and injustice about this historic and systematic discrimination and oppression of indigenous people. The political objective, above all, is to guarantee the social and political integration of indigenous communities through two fundamental elements: recognition and respect for the autonomy, both political and legal, of their territories. Among their demands are the right to use and enjoy the natural resources of their territory – the natural environment – and development programs. Further they demand the right to their culture and politics, quality indigenous education, preservation of native languages, management of their own mass-media, and protection of their way of doing democracy. This last point places importance on the collective rather than the individual, and emphasises valuing and seeking consensus in decision-making, autonomous municipalities and the principle of “lead by obeying”. “You are in Zapatista rebel territory. Here the people command and the government obeys. Council of Good Government, Central Heart of the Zapatistas Facing the World. Highlands Zone.” Zapatista zone of self-government, the Highlands Chiapas. The EZLN believe we have reached a moment when indigenous movements against injustice can no longer be reduced to local issues; local issues form part of a global economic and socio-political structure. This is the point from which all of the excluded, marginalised and invisible become defined as public actors in the process of neo-liberal globalisation. This unique political argument seeks to create or re-create the self-confidence of minority groups’ status by asserting a collective identity of “we”. An identity which is broad, and consists of the marginalised of the world and covers everything – “all of the colours of the Earth”, a new utopia, “a world where many worlds fit” and built without exclusion and with active and diverse participation. From the first “gatherings in the jungle” a wide and loosely networked movement emerges and globally connects at international level “anti-globalisation” demonstrations and the World Social Forums. Today we know that the Zapatista movement has no intention of converting itself into a vertical political organisation. They want not only to change the government, but the world and to do that through a decentralised, heterogeneous organisation. The path and objectives are long-term now and a period of review of the “rhythm” and “companions”, or opportunistically placed allies, of the movement is beginning. What is clear is that the Zapatista movement is a complex phenomenon in which numerous actors and processes converge and result in the construction of a political identity, a new form of citizenship with global reach. The importance of the incursion of the Zapatista movement in the political arena is that it shows the exhaustion of the current democratic model in the service of regime of capitalist accumulation, which denies difference, and has no intention of recognising real equality. Therefore, the Zapatista struggle sets the precedent which can open the possibilities for the liberation of other marginalised groups and oppressed people of the world. We were born of the night. We will die in the night. Our fight has been to make ourselves heard, and the bad government screams arrogance and closes its ears with its cannons. Our fight is for work which is just and dignified, and the bad government buys and sells our bodies and our shame. Our fight is for life, and the bad government offers death as our future. Our fight is for justice, and the bad government is full of criminals and assassins. Our fight is for peace, and the bad government announces war and destruction. These were our demands over the long night of the last 500 years. They are today, still, our demands.